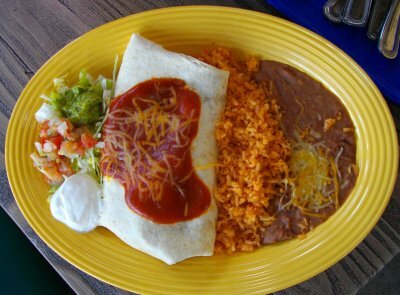 Trying to be the master of a particular subject I started this blog so I could be the authority on Mexican restaurants in Orange County. Having been to about 200 of them so far there's still many more to get to and I often get e-mails from people asking, "How could you possibly have not been to such-and-such restaurant yet?" Well, sometime before now and Doomsday (2012?) I may make it to all the Mexican restaurants in the county but any time mealtime comes up for me and I decide I can make it out for a Mexican meal I have literally over 350 choices to choose from, so . . . my goal will be met, it's just not going to happen all at once. Fortunately, other bloggers help to fill in some of the gaps so be sure to check out the other blogs I link to here. 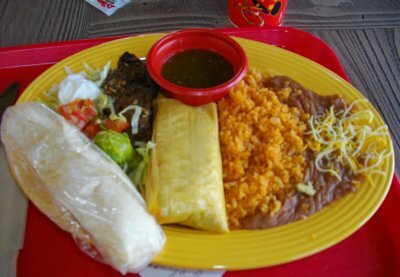 I can however be the guru of a smaller subject so I have found it more readily in my grasp to be on top of all Mexican food at the Disneyland Resort (click here for our extensive coverage). 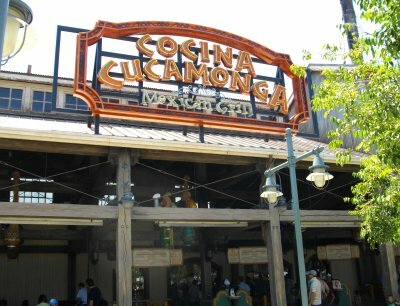 Cocina Cucamonga in Disney's California Adventure is the first one I covered and that was three years ago and now it has just reopened in a new spot with a revised and expanded menu. 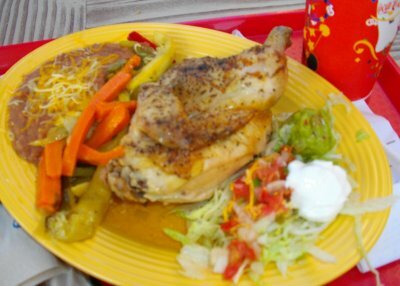 New items include Fire-Grilled Citrus Chicken, Carne Asada, Chicken Tamales (which were tested during the recent Wine and Food Festival), Soft Tacos Monterey, and a Fajitas Ensalada. Click here for better pictures of the menu. While I admire the fact that they upgraded the menu a minor downside to it is that it is now too much like Rancho del Zocalo in Disneyland proper, when, prior to the upgrade, each of the three Mexican restaurants at the Disneyland resort were very unique. Perhaps a menu revision at Rancho del Zocalo will rectify that. My chicken tamale turned out pretty moist and meaty while the carne asada it came with appeared at first to be shriveled up and burnt (a little exaggeration here) but turned out itself to be moist and tender with a robust, marinated, cracked pepper taste to it. Beans and rice on all the dishes are very standard. Tortillas come freshly made form the nearby Mission Tortilla Factory. 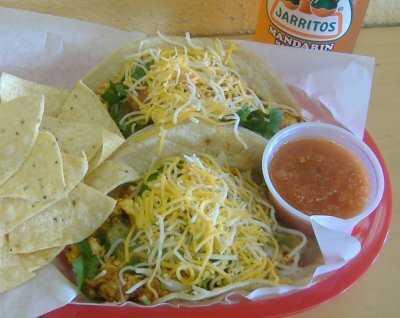 If you get the citrus chicken make sure they give you the tortillas that are supposed to come with it. Yes, they forgot to give me mine, and, yes, it was probably a fluke, but do check your order before you walk off with it. 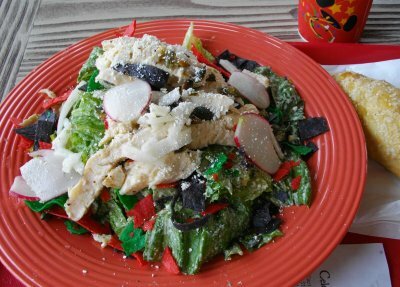 The caesar salad was light and refreshing, great for a summer day, and surprising that they would put something on it as "authentic" as pepitas (roasted pumpkin seeds) and radishes. Also, on my first visit, when I went up to the pickup window I looked at the soda fountain and saw that they had Mello Yello (the Coca-Cola company's answer to Mountain Dew) even though it's not listed on the menu board. On my next visit back I ordered a Mello Yello but the cast member taking my order said they don't have it. I said, "Well, I saw it on your soda fountain the last time I was here." He said, "Yeah, I know, they put the stickers on there for some reason and got all us cast members excited . . . but we don't have it." Sounds like an entry for the FAIL Blog. Don't sneeze driving past this place because you might not see it. I have been a number of times myself and I always have to pay attention to make sure I don't inadvertently whizz right on by. 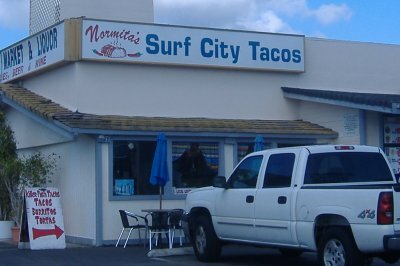 Normita's most definitely counts as a "hole-in-the-wall," a very homey place where the locals stop for some good grub before or after the beach. And Normita (or "Norma") herself is almost always there to engage in friendly banter with every customer. It was only about three months ago that I realized they had breakfast items. Or it might've been my first visit to there that was anywhere near breakfast time. I tried the breakfast tacos first since breakfast tacos are much less common than breakfast burritos. 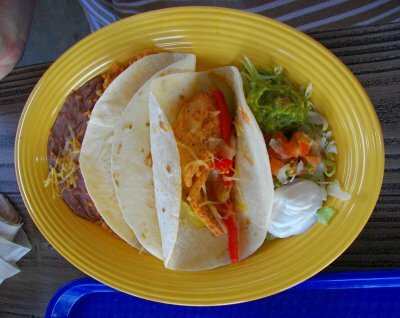 Served in corn tortillas and stuffed with your choice of meat (I think the choices are carne asada, chicken, or carnitas; maybe fish too) and fresh onions, cilantro and grated cheese these are a sort of innocent cross between Americanized tacos and authentic street tacos. You get a choice of red or green sauce and whenever I have that choice I almost always go for the salsa verde. When I went yesterday it was time to try the breakfast burrito. 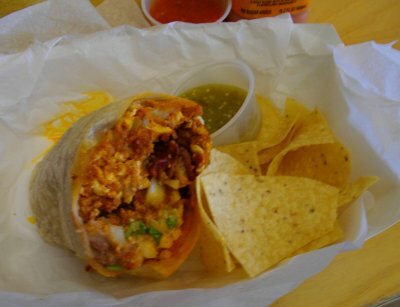 A big flour tortilla loaded with chorizo, scrambled eggs, bacon, and, once again, your choice of red or green sauce. Yes, I went for the green sauce again. You also get some chips and salsa with every order and I was constantly dipping my chips into both red and green salsa. I wonder if Normita would give me her secret recipe for these. She did mention that her lunch and dinner menu might be overhauled soon but that the breakfast items are likely to stay the same. The breakfast burrito was $5.50. I can't remember the price of the breakfast tacos but I believe they were in the $2-3 range. Or CLICK HERE to read it all at once. UPDATE: see here for information on a Naugles revival separate from Del Taco. Just found out that Del Taco has brought back the Orange Shake again. This time around it tastes a little more like their original orange shake than their orange and cream shake they had about two years ago . . . but with so many months and years in between each of my orange shake tastings I could be wrong and maybe they've always used the exact same formula. I also had somebody tell me recently that the orange shake was a Naugles item that got ported over to the Del Taco menu. We have extensive coverage of Naugles that you can read by clicking here, and we're crossing our fingers that Del Taco will bring back some of the Naugles items (although a couple secret Naugles items are still available). I think it'd be a marketing coup d'état if they made such a move. "Move over, Coke Classic, here comes Naugles." And we get about 30 - 40 hits a day here from people looking for Naugles info. Oh, and there's also orange iced tea at Del Taco now. You can also read our extensive Del Taco coverage by clicking here. Good things come to those who click. 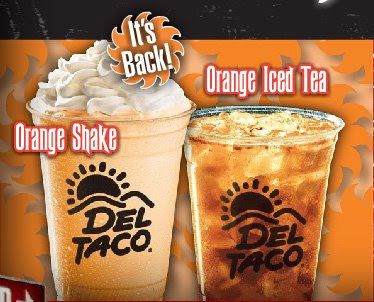 (LAKE FOREST, CA) July 15, 2009 – This summer, consumers may not be indulging in expensive vacations, but they can certainly chill out with an old favorite as Del Taco brings back its delicious classic Orange Shake. In addition to the Orange Shake, Del Taco is introducing a new freshly brewed Orange Iced Tea combining fresh brewed tea with a splash of citrus orange. "Orange is a great flavor for summer and our new orange flavored beverages offer a delicious, refreshing chill to any summer day," said John Cappasola, vice president of marketing at Del Taco. "Our customers have told us that they love our Orange Shake and we think they'll love our new Orange Iced Tea too." Now THESE are how korean tacos should be. 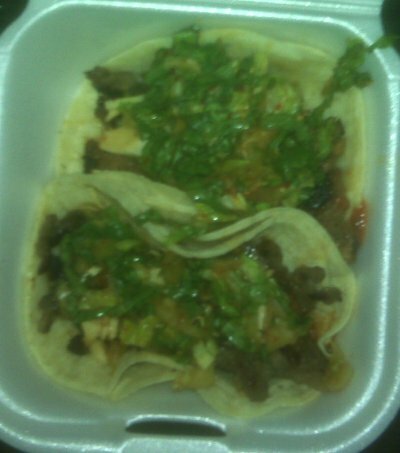 They were honestly a great amount better than the baja kogi crap i had earlier today. yes, i had korean tacos twice today. The flavor of both the pork and steak was great where baja kogi was a little bland. They seem even more bland after eating these. They come with a type of cabbage that doesnt have a lot of flavor but you can tell theres a small amount of an asian hot sauce. My one regret is after I finished I looked in the bag and there was a small container of what ended up being a thick teriyaki type sauce but the flavor was good and it was not that strong. 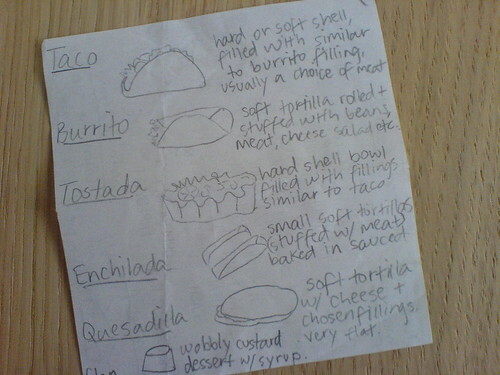 I wonder how that would have gone on the actual tacos. Guess I will have to go back. 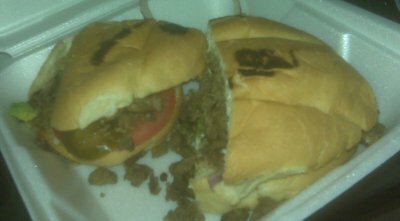 I also got a torta de asada which was whatever. Kim's Tacos were $1.79 each and were smaller than the normal tacos. 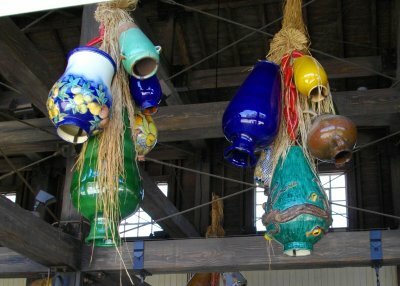 I'm going to try to make it there soon myself to try these out and get some more pictures. Thanks, Jonathan. 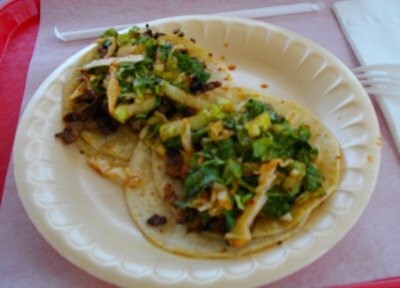 If anyone else knows of a place to get Korean tacos within the county line let me know by sending an e-mail or leaving a comment here. Also, you can click here to read our complete coverage of Korean/Mexican fusion all at once.